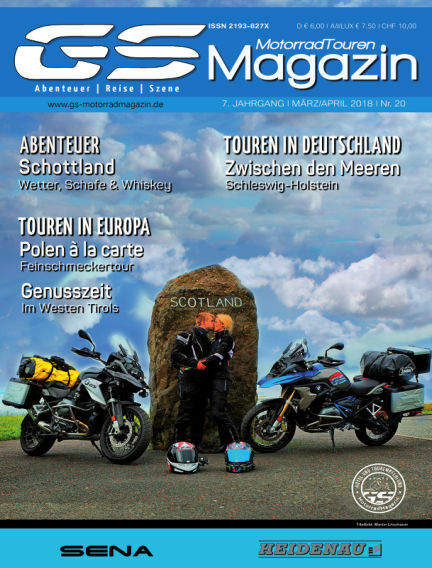 ABENTEUER/Schottland: Wetter, Schafe und Whiskey - TOUREN IN EUROPA: Polen á la carte - auf Feinschmeckertour, Genusszeit: Im Westen Tirols - TOUREN IN DEUTSCHLAND: Zwischen den Meeren, unterwegs in Schleswig-Holstein. With Readly you can read GS:MotorradMagazin (issue Nr. 01 2018 (#20)) and thousands of other magazines on your tablet and smartphone. Get access to all with just one subscription. New releases and back issues – all included.